“It’s good. I get to end on a high note,” said Lia Hoyte. The fourth-year player was just named to the Réseau du sport étudiant du Québec first all-star team, as well as the second all-Canadian team, made up of the country’s best players, in her graduating year. 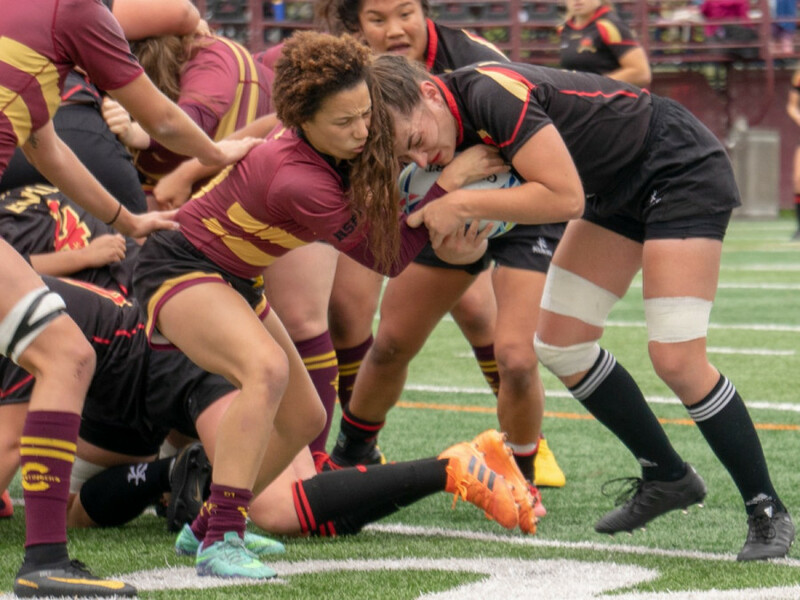 Hoyte, a scrum half for the Stingers women’s rugby team, was one of the few veterans on a young, rebuilding Stingers squad this season. In fact, of the 27 players on the team’s roster, Hoyte was one of just seven in at least their third year of university action. That’s the kind of environment that usually results in a foundation built for the future, rather than individual player honours. The latter certainly came as a surprise to Hoyte when she saw her name on the all-star list. “I was not expecting it at all. It was the first award I ever really won for rugby so it’s pretty exciting,” said Hoyte. At the start of the year, her coach wouldn’t have predicted her team would see Hoyte’s honours as well as all-star nods for two of her younger players as well. Coach Jocelyn Barrieau had come into her first year at Concordia with a young team that got hit with injuries to key players early on in the year. Seeing her players earn this kind of recognition is great for her personally, but it is also a big boost to the future of her team. “It was awesome […] it keeps us in the conversation. It helps with recruiting and confidence,” said Barrieau, calling the time the all-star list came out “a great day” for the team. While it may not have been something she expected at the start of the season, Barrieau knows why Hoyte earned the accolades this season. She’s well aware of the calibre of player she has and what Hoyte brings to the table. “Speed, speed, speed. Lia just does everything so quickly. She really surprises and takes defences by storm. This year she was a real spark plug,” said Barrieau of what Hoyte brings to the game. Hoyte was also named Stingers game MVP three times over the seven game season. But with a team so young, Hoyte’s veteran presence was just as important as her speed on the field. After the departure of Frédérique Rajotte and Alex Tessier, two athletes that defined Concordia rugby for half a decade, Hoyte realized it was time for her to become that leader. “It was really different. I haven’t really been a leader on the field [before] but this year I had to step up. It was a different role. It was fun and challenging in a different way,” said Hoyte. That meant learning to be a more controlled player, keeping emotions in check and handling interactions with players in a way she hadn’t done so before. Hoyte began to take on a teaching role, rather than simply telling young player what to do. She made sure that young players had someone to lean on in a difficult year in terms of results on the field. As one of the oldest players on the team, Hoyte understood the need to take charge. There has to be someone that players, especially young players, can lean on in difficult moments. Hoyte knew early on that she would have to step into that this year. Despite these new responsibilities and 2-5 team record, Hoyte still really enjoyed the season. Even when they lost, Hoyte said the team managed to have fun. She said she’d never played with a group with as much heart as this young one. Another thing that may have helped the fourth-year player enjoy the season was having her own familiar veteran voice present. Tessier, who Hoyte spent her first three Concordia season with, joined the team as an assistant coach. Having played with several of the older players, Tessier had a good shorthand with Hoyte and several of her teammates. “We already had somewhat of a relationship, so it was easier to understand when things are happening on the field because I’ve lived those experiences with them,” said Tessier. Looking forward, Hoyte is feeling excited about the Stingers future. With 20 of their players having only played one or two seasons, Hoyte believe the team has a lot of talent that will grow and be with the team for a long time. Even if she won’t be there, Hoyte is looking forward to seeing what the team becomes. Hoyte is set to graduate from Concordia’s exercise science program this year. Though there are no current plans for her to return for a fifth year of eligibility at the moment, she hasn’t completely closed the door on the possibility. “Maybe I’ll be back. We’ll see. Unconfirmed,” she said with a chuckle on the possibility.